The men and women of the East Greenwich, NJ Police Department are honored to protect this great community and all others that call it home. Beginning in 1695, when Old Gloucester County was divided into "Constablewicks," a constable was the person who maintained local law enforcement, working in conjunction with the county sheriff. The position of constable was usually a part-time one, so in addition local citizens often formed organizations to protect their residents from harm, and to pursue those suspected of stealing horses, mules, livestock, wagons and other personal property. On February 7, 1914, an association known as "The Mickleton Mutual Pursuing and Detective Association," was formed with Herbert Brown as first president with 196 citizens joining this group. 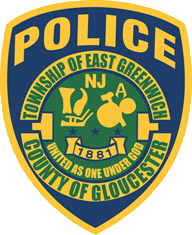 The first East Greenwich Township constable was Hugh Mulvey. The last two constables of East Greenwich were Christian Miller and Warner "Doc" Bundens. Warner Bundens became our first police chief in the 1920's, when he was officially appointed by East Greenwich Township. At that time, deputies were temporary appointments, as needed.